Jobs through additional customer spending can be created at our nation’s airports through improved Customs and Border Protection (CBP) customer service if CBP and the private sector work better together on this issue. Moreover, it will improve security. Recently, I obtained CBP customer service data for 2014 through a Freedom of Information Act request. I showed in a previous post that the majority of the complaints received by CBP across all ports of entry were for employee conduct. 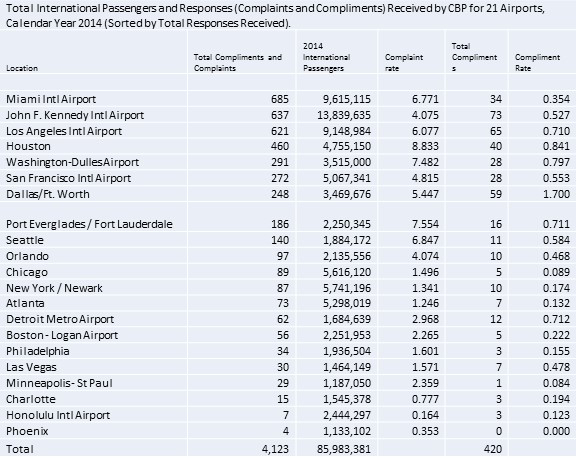 Further analysis shows that CBP received more than approximately 4,100 comments from the 21 busiest airports, including 3,700 complaints. The number of dissatisfied individuals could be much higher because, as Diane Halstead writes in the Journal of Business Research, despite widespread dissatisfaction with products and services, consumers choose not to complain for a variety of reasons, which can be summarized as high transaction costs. These include the time, cost, and effort involved, uncertainty about how to complain, and beliefs that re-dress will not be provided. To account for the actual number of individuals who might have complained research suggests that on average, across all industries, 50% of consumers will complain about a problem to a front line person. Only 1-5% of customers will escalate their complaint to a local manager or corporate HQ. Therefore, if CBP national headquarters received 3,700 complaints, then between 74,000 and 370,000 customers might have been unhappy with their service during this time period. This should be considered low as it does not represent the entire traveling party who might be spending money at the airport. If these customers cited above were less stressed, then they might spend more money at the airport than otherwise. This is because passengers arriving from international destinations may experience: (1) waiting in the Federal Inspection Services (FIS) terminal to be admitted into the United States, and (2) passing through CBP security checkpoints. Moreover, if this location is not their final destination, then they will also have to pass through TSA security checkpoints. It is important, therefore, to not add to the level of existing stress. The information provided above is useful because it forms the baseline from which security can be improved and jobs can be created. Efforts to improve customer service help increase revenues by slashing the amount of stress that customer’s face. Passengers that report high levels of satisfaction tend to spend up to 45% more in retail shops at airports. So if an enplaned passenger spends $5.00 (median amount per passenger in 2012) in the airport for food and beverages, then a more satisfied passenger might spend as much as $7.25. For news, gift, and specialty retail establishments, the amount may increase from $3.10 to almost $4.50 per enplaned passenger. If all passenger satisfaction were at this level, it could yield as much as $1,350,000 in additional consumer spending. According to US Travel, every $1 million in travel spending creates more than 10 jobs and so an additional 13 jobs might be created at our nation’s airports. Many of these individuals arriving in the United States have been on relatively long flights and some still have connecting flights. 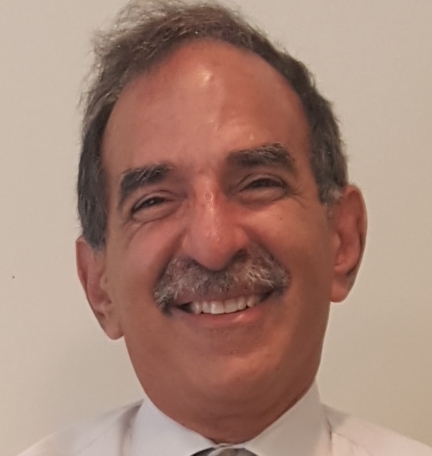 Therefore, a countless number of individuals may already be considered anxious and being interviewed by a CBP officer in the FIS environment may make them even more stressed. The Office of Personnel Management states that for the Customs and Border Protection officers must have the “ability to work effectively in stressful situations.” Therefore, it seems important that from a security perspective a calm environment would allow officers to be able to better differentiate those individuals who require additional adjudication. In sum, additional jobs can be created at our nation’s airports through improved CBP customer service—if CBP and the private sector work better together on this issue.